Tanton’s advocacy of the area model for multiplication is a nice lead-in for a collection of interactive array models of multiplication that we designed for the Dynamic Number project. In the websketch below (and here), students use an array model to model and solve multiplication problems. They start by dragging the point in the upper-right corner of the array to adjust the array’s dimensions. They then split the array into as many as four smaller arrays that represent “friendly” facts—facts whose products they already know—by dragging the point inside the array. Students then add the partial products to solve the original multiplication problem. As a companion model, the websketch below (and here) allows students to decompose two-digit multiplication problems into tens and ones by maniuplating a dynamic array of base-ten blocks. In 2009, Scott and I began experimenting with interactive array models and decided that they could form the basis of an appealing game for elementary-age students. 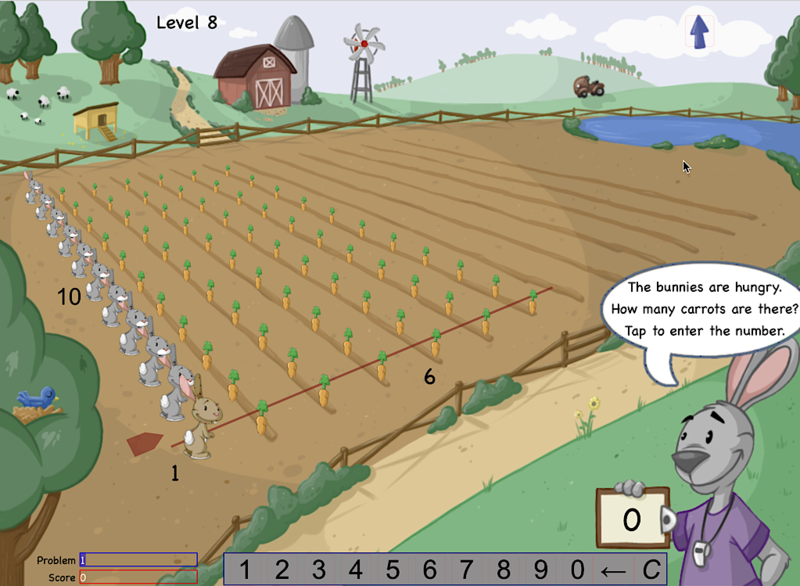 Our Bunny Times game replaces the conventional arrays above with adjustable arrays of carrots.